Precious metals futures advanced on Wednesday with gold and silver snapping a three-session losing streak. Platinum and palladium closed higher for the first time since Friday. Gold for February delivery added $1.90, or 0.2%, to settle at $1,087.10 an ounce on the Comex division of the New York Mercantile Exchange. "Gold remains a destination for ‘safe money’ during the flare ups of volatility and further weakness in global equities could fuel a continuation of the recent rally into the mid $1,100s in the near term," analysts at The 7:00’s Report said on Wednesday according to MarketWatch. But longer term, "gold will take its cue from the dollar and [U.S. Federal Reserve] policy expectations." Gold prices ranged from a low of $1,079.40 to a high of $1,093.70. They shed 1% on Tuesday, dropped 0.2% on Monday and lost 0.9% on Friday. On Thursday, yellow metal closed at $1,107.80 for its highest settlement since Nov. 3. Silver for March delivery surged 40.5 cents, or 3%, to settle at $14.156 an ounce. 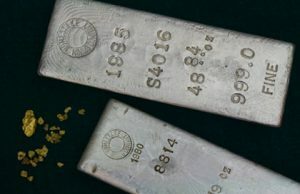 Silver prices traded between $13.75 and $14.21. They slipped 0.8% on Tuesday. April platinum rose $12.70, or 1.5%, to $851.30 an ounce, ranging from $833 to $855.80. Palladium for March delivery jumped $16.85, or 3.6%, to $486.65 an ounce, trading between $467.25 and $499.95. Gold added $2.75, or 0.3%, to $1,088.15 an ounce. Silver declined a nickel, or 0.4%, to $13.83 an ounce. United States Mint bullion coins logged a third straight day of increases. On Monday, the bureau released its annual coins with a 2016 date. Advances on Wednesday included 4,500 ounces in gold coins and 354,000 ounces in silver coins. The latter was all 2016 American Silver Eagles. Nearly 88% of the week’s supply has now been claimed. The U.S. Mint allocated 4 million Silver Eagles this week. With Wednesday’s gains, there are 500,000 left until more become available on Monday.